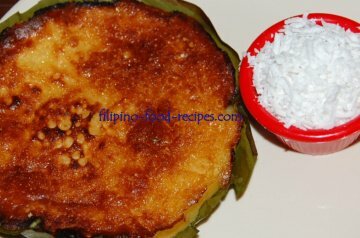 Bibingka is a popular Filipino rice cake commonly served during Christmas time. The most common kind is that made from regular rice. The process of making it from scratch is by first soaking rice grains (bigas) and cooked rice (kanin) in water overnight, then grinding them fine to have the consistency of galapong or rice dough. Then milk, butter, eggs and baking powder as leavener are added, just like in making a real cake but with the consistency of a pancake batter. The easier process is by using rice flour instead of doing the rice soak overnight. The challenge, really, is in the cooking -- which uses direct heat using charcoal for both top and bottom. Baking in the oven, which cooks with indirect heat, will do, but will not give the same result. The texture will be soft and spongy like that of a cake. A close option to the traditional direct heat method is by first cooking on the stove top for a few minutes to set the bottom, then finishing off under the oven broiler to brown the top. 1 Mix all the ingredients together. 2 Prepare the banana leaves to use as liner and set on a round pie or cake pan. 3 Pour the mixture on the pan and bake for 20 - 30 minutes or until set. 4 To get a golden brown top, set the pan under the broiler for 3 - 5 minutes. 5 Serve with grated coconut. The banana leaf could float on the pan and end up at the center of the bibingka during cooking. An option to solve this is to start cooking on the stove top to set the banana leaf at the bottom of the pan before putting inside the oven. The banana leaf gives a distinct flavor to this rice cake during cooking that's why it's traditionally part of the recipe, but can be omitted if not available. You could put assorted toppings for the Bibingka, like salted egg, cheese, or sugar mixed with coconut cream.